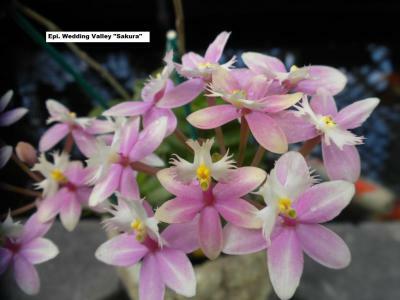 Here at Kawamoto Orchids we sell many types of epidendrums orchids in Hawaii. Epi's are also known as the "Poor Man's orchid" because they throw so many keiki's off of each plant and are usually given away to friends and family. . The epidendrum is one of earliest established genera of orchids with over 1,000 different species. Many Epidendrums can be found growing at sea level, and some of its species can be found at higher elevations up in the mountains. 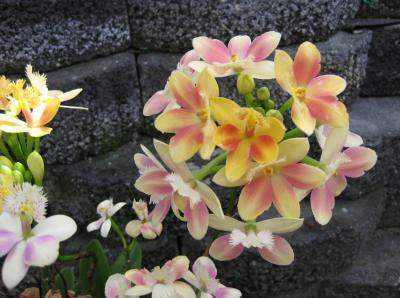 Most Epidendrums have reed-like stems that resemble the Dendrobium orchid’s growth habits. These inflorescences are usually long and produce brightly colored clusters of flowers in shades of white, orange, red, yellow, lavender, or fuchsia. Here in Hawaii we only grow and sell the warm growing tyoe of epidendrum. Water- Epidendrums like lots of water in the growing season as they are very fast growers and need sufficient hydration to build new growths. Water every 2-3 days throughout the spring and summer growing season. Less water is required in the fall and winter months. Water every 5-7 days at that point, allowing the plant to almost dry out between waterings. You can help encourage bud growth by withholding water for about a month, however, make sure that your orchid remains happy. Light- This is a very important requirment for growing and blooming epidendrums well. They require high light throughout the year. It should be equal to or slightly more than that given to cattleyas. Some epidendrums actually will acclimate to full sun. If your orchid is receiving the ideal amount of sunlight the foliage will be grassy green with a slight tinge of red in color. If your plant is receiving too much light the leaves can start to turn a brownish-bronze or dark reddish color. If you do not give enough light it will cause the orchid to become very tall and will keep the plant from producing flowers. Temperature- Epidendrums can adapt to a wide range of temperatures. Nighttime temperatures can range between 55 to 70°F and daytime temperatures 80 to 90°F. Plants can tolerate temperatures of up to 100°F, if shading, humidity, water and air circulation are increased. Most epidendrums can tolerate low temperatures into the low 40's for short periods of time. Humidity- The ideal humidity range to grow your Epidendrums is somewhere above 50%-60% humidity. Remember to have adequate air movement for your orchids by opening a window and letting in the breeze or by placing an oscillating fan nearby. This will help mimic the breeze that the orchid would receive in nature. Potting- Epidendrum like to potted with a medium that allows for good drainage. A recommendation is to mix both a fine and medium-grade bark with perlite works really well. Epidendrums can also grow very well attached to a mount, in raised planter beds (never pot with dirt), or outside in x-large cement or clay pots if you live in an area that doesn’t experience frost. Once the plants begin to grow taller you should stake them for support. We recommend repotting every 2 years.